Don't want to wait? Email us at [email protected] to get yourself on our monthly email list! 1. Start by greasing a 9 x 13” casserole dish then set aside. Slice each zucchini in half lengthwise. Using a melon baller or metal teaspoon, hollow out the center of each zucchini. Lightly brush the tops with one teaspoon of olive oil then place them skin side down in the casserole dish. 2. Next warm the tablespoon of olive oil in a large skillet over medium heat. Add the onion and the peppers and cook for 2-3 minutes. Then add the rice, corn, and beans along with the salsa, chili powder and cumin. Stir everything together and continue to cook for about 5 minutes then remove the skillet from the heat and set aside. 3. Preheat the oven to 400°F and then stir in 1/4 cup of the cilantro and salt to taste to the filling. 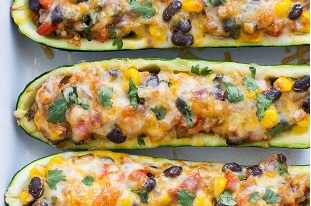 Spoon the filling inside of each zucchini until they are all full. Sprinkle each half with cheese then arrange them in the dish and cover with foil. Bake in the oven for 25 minutes then remove the foil and set the oven to broil. Cook them for 5 more minutes, until the cheese is bubbly and golden brown. 4. Allow them to cool for 5-10 minutes then top with fresh cilantro and serve. Store leftovers in an airtight container for up to 3 days. “I woke up this morning and I can’t turn my neck.” This has been a common complaint this summer in the northtowns of Buffalo. It’s time to come and see us. The health offices at Riverview Chiropractic Health are here to serve you. When it is hot at night, we put on the air conditioning and/or the overhead fan goes on. It gets cool over night as you move from side to side to get comfortable in bed. The covers go on and off. Then you wake up in the morning and you find this restricting pain. It can happen as a young child, school kids, grown kids, adults and even Grandparents can get spasmodic Torticollis. This has been a recurring scenario in our health offices this summer. The diagnosis is Torticollis after our turtle and tortoise friends “Torti” and collar “collis”. Our reptilian friends can not turn their head to look over either shoulder. Now, neither can you. Some people who experience this malady will often be too afraid to have anyone touch it right away. Don’t let that get in your way. The doctors have many ways they can use to adjust you. A chiropractic adjustment can be administered by hand, table assisted or even with a tool we call an activator. If you are in so much pain that you can’t be touched, we can still help.The real key is getting to it right away. The sooner you are examined, the sooner help will be on the way. Some babies are born with or shortly after acquire a form of torticollis and head shape that takes months to work out. This infantile torticollis and plagiocephaly is a different treatment protocol, but can be addressed and healed naturally without surgical intervention. Our health offices often get referrals from local physicians and physical therapists to help babies to overcome this condition with gentle chiropractic care. But children and adults who incur spasmodic torticollis will be feeling better within a few days. Any range between 3-5 visits is expected. However, even after your first adjustment the range of motion in your neck will be enhanced noticeably and a better night’s sleep will be yours. There will be some home exercises utilized as well as some soft tissue work at your visits. Home use of ice and biofreeze or sombra can be helpful. A massage can also help your body to heal comfortably. Is it too late? Maybe this has happened to you a while ago and you have just not felt right since. No, it is not too late to make an appointment and start feeling better. We have seen patients that develop a head tilt due to the contractures of the musculature that develop in time of not getting adjusted. As with any injury, postponing treatment can delay the healing time. What if it happens again? Unfortunately, this condition can recur. That is why it is so important to stick to the treatment plan that your chiropractor sets out for you. Everyone is different and we experience different challenges in our own unique way. But, even if it happens again, we can help you to overcome it quickly. How do I prevent it? As with many conditions, regular chiropractic care that we call “Maintenance” visits can help you to keep Torticollis away. Being careful of temperature changes through the night can also play an important role. Regular exercise is important for all of us. Keeping our muscles and cardiovascular system active is a very important part of prevention. Regular and appropriate sleep schedules can help. Being sure you are drinking enough water is very important, especially in the summer months. Lastly, eating an anti inflammatory diet is particularly helpful in keeping Torticollis and any musculoskeletal condition in check. Foods high in refined flour, sugar and nutritionally empty carbohydrates can be the enemy when your body is feeling inflammation. The goal for our health offices is to help generations of families to pursue optimal health naturally. We are here to answer any questions you may have about torticollis, neck pain or any challenge you are facing to your health. Trying chiropractic first is excellent advice when your body is facing any health challenge. Working naturally with joint motion, soft tissue therapies, nutrition and exercise can keep you living the lifestyle that you desire. 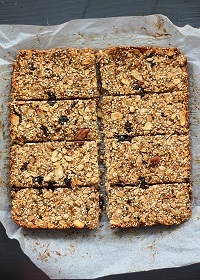 These granola bars are packed with banana, dried fruit, quinoa, oats and chia seeds. They're a great on the go breakfast or fuel up snack! Gluten free too. 1. Preheat oven to 350 degrees F. Line an 8x8 inch baking pan with parchment paper to prevent bars from sticking. 2. In a large bowl, combine oats, uncooked quinoa, chia seeds, salt and cinnamon. Stir in mashed banana and vanilla. Fold in almonds, pecans (or walnuts) and dried fruit. 3. Place a small saucepan over low heat; add in almond butter and honey (or maple syrup) and stir until warm and almond butter is melted. Fold into granola bar mixture until well combined. Pour into prepared pan and press down firmly with hands or with a measuring cup to help bars stay intact. Bake for 25 minutes or until edges turn golden brown. Allow to cool completely before cutting into 10 bars. I cut mine into 8 originally and they were much too filling for a snack, so I reduced the serving size to 10. Feel free to mix and match dried fruits and/or nuts as you see fit. These bars can be stored at room temperature for a few days, but are best kept tightly wrapped in the fridge or freezer. It’s summer, and many of us will be leaving for vacation soon. So often we plan our hotel, destination, activities, and how we are getting there, but we forget to plan how we are going to remain healthy while travelling. In the end, this little extra step can help to make the trip, and return, more enjoyable. It can be difficult to be stuck on a plane, or in a car, and to not know when or where the next meal will be. Bringing healthy snacks along can be immeasurably helpful. It seems easy to bring food along on a road trip, but did you know that you can bring food along on an airplane? And not just granola bars; entire salads are allowed on planes as long as the dressing is already on the salad. Remember, if there is anything liquid, or seemingly liquid like puree or yogurt, it is subject to the 3.4 ounce restriction. However, fresh produce, granola, meats and fish, and even sandwiches are allowed through TSA. They may have to be discarded on the plane if travelling internationally, but it is good to know that there are more options than overpriced and frequently unhealthy airport food court items. Always check TSA regulations and individual customs policies at each destination for updated policies regarding food carry-ons. Determine what amenities are available in your hotel or rental property. Is there a mini-fridge, kitchenette, or even full kitchen? This may help you know if you can bring along some food and beverages or purchase supplies at local stores once you arrive. Substituting occasional meals and snacks, such as those up until dinner, at restaurants in favor of some that you make on your own can help you monitor nutritional intake more closely. After a successful day of healthy choices, you can go ahead and dine out for dinner with less concern for more nutritional choices. Everything in moderation—it is vacation after all! Don’t forget to carry snacks that travel well as you engage in your vacation activities. Examples include granola, fresh fruit and vegetables, nuts, unsulfured dried fruit, trail mix, pre-peeled hard-boiled eggs, and single-serve packs of almond butter or guacamole. If you choose to take more perishable foods, small coolers or lunchboxes with an ice pack can help to keep them fresh. Don’t forget to opt for ice packs that are hard and gel-free if you are carrying them on a plane! Another tip for healthy eating while on vacation is to set rules before leaving your house. What will you continue to restrict, and what will you allow in moderation? For example, will you allow yourself to have a dessert after dinner? Or will desserts be off limits while you allow yourself a burger for lunch? Once again, everything in moderation! Hydration is important too! To make it easier, bring along a water bottle or travel mug. Refilling will be easy without having to purchase additional plastic water bottles, plus you will have a constant reminder to drink water every time you see it. Not to mention, if you carry along a few teabags, you can refill with hot water and make your own tea for free! One of the situations to ensure you drink a little extra water is while on an airplane. The cabin can be very dehydrating, but you can fill up a water bottle as soon as you pass through security in the airport, so don’t forget drink up! Remember, if you feel like you have eaten a little extra, or cheated on your diet more than you had planned, there is always room for some physical activity. Bring your sneakers and hit the gym at the hotel or go for a walk to get in a few extra steps. Whatever you, do enjoy yourself! Things will go back to normal when you return, so have fun on your well-deserved vacation! 1. Preheat the oven to 350ºF. Line an 8x8” square pan with parchment paper and grease with coconut oil. 2. Combine coconut flour and salt in a bowl. Add the maple syrup and coconut oil and stir until fully combined and a large dough ball forms, making sure to press out any clumps of coconut oil. I used my hands at the end to bring the dough fully together - you want it to be completely smooth. You can also mix it in a stand mixer fitted with the paddle attachment. 3. Press the dough into the prepared pan. Bake for 15-17 minutes, or until golden brown around the edges. Let cool completely. 1. Combine the almond butter, maple syrup, coconut butter or oil, vanilla, and salt in a small saucepan and heat until all of the ingredients are melted and throughly combined. Alternatively, you can heat the ingredients in the microwave for 45 seconds, or until melted and smooth. Add the toasted coconut and stir in. Pour over the crust and let cool in the refrigerator until set. Cut in 16 squares. 2. Melt ½ cup of the dark chocolate in a small bowl in the microwave, and stir until smooth. Dip the bottom of each bar into the dark chocolate, scrape off the excess chocolate on the side of the bowl, and place on a parchment lined baking sheet to set. 3. Melt the remaining ¼ cup dark chocolate in the microwave and transfer to a small piping bag or ziplock bag with the corner snipped off. 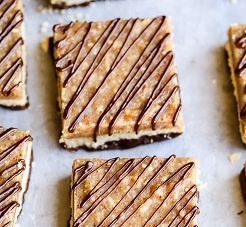 Drizzle the chocolate over the bars. 4. Store leftovers in the refrigerator or freezer - they’re delicious frozen! The sunshine and warm temperatures are back and that means that the season of BBQ's, carnivals, weddings and graduation parties is upon us! While most of us look forward to the summer and all of its wonderful festivities, it can sometimes be challenging to keep eating healthy with sweet treats and picnic-y foods all around. Here are some tips to enjoy the most of what summer foods have to offer, but keep inflammation and waistlines down! All recipes are notated at the bottom. Summer brings an abundance of fresh fruits and vegetables that are in season and much cheaper to purchase. Making use of CSAs and farmers markets can help you get more bang for your buck too. This is a great time to buy strawberries and cherries earlier in the season, with blueberries and peaches later in the season. Going to a local farm and picking fruit is a fun outing for the whole family and a great way to teach kids about healthy eating. Check out the Environmental Working Group's “Dirty Dozen” and “Clean Fifteen” lists can also help you decide which produce is better to buy organic and which is safer to buy conventionally. With so much produce available, it's easier to replace pasta and rice with veggies. Spaghetti can be substituted with spaghetti squash and spiralized yellow squash or zucchini (1). Sweet potato fries are a great alternative to processed french fries and did you know the cauliflower works great instead of rice (2)?! Quinoa and lentils are wonderful sources of fiber and protein and work well in cold summer salads instead of traditional pasta salad (3). Replacing heavy, mayonnaise-based salads with lighter salads dressed in vinaigrette is a healthy way to cut the calories and processed foods. Coleslaw can be made without mayo and bean salads are another way to get loads of healthy plant-based protein and veggies into the diet (4) (5). Buying dried beans and soaking them overnight before cooking is an even healthier alternative to canned beans (if you have the time) and can help reduce gas that is sometimes experienced with this food group. “I scream, you scream, we all scream for ice cream” … and sometimes our bodies scream afterwards! If dairy is an issue for you, fruit sorbet can stand in for dairy-based ice cream without the belly problems or migraines. Reward kids with sweets from fresh fruit instead of cookies or processed sugar. It's easy to make banana “ice cream” at home too, in lots of flavors, where you can control what goes inside and have fun in the process (6) (7). Dip fruit in 70% dark chocolate for an extra delicious treat packed with healthy antioxidants. When the heat rises, so should your water intake! Can't stand the taste of plain water? You can infuse it with lemon, lime, orange, mint, cucumber, etc. Be sure not to add flavor packets filled with sugar or artificial sweeteners, though. These products add to our inflammatory load and negate the healthy move of drinking extra water. Brew your own iced coffee and iced teas and some something bubbly, sparking water is a better alternative to soda. A drop or two of liquid stevia can give you a hint of sweetness without the added sugar. My favorite part of summer eating is grilling but lots of extra sugar, preservatives and other chemicals can be hidden in bottles of BBQ sauce and meat marinades. You can make your own spice rubs (herbs and spices are wonderful for health) and marinades to infuse tons of flavor into your meats before grilling (8). The longer you marinate, the better, so try it overnight! If you do buy prepared products, check the ingredient labels to avoid products with sugar (or sugar alternatives like high fructose corn syrup) at the top of the list. Here's to a happy, healthy summertime filled with lots of good food and sunshine! Here's the yummy recipe for the Mac & "cheese" made with butternut squash from Jamie Rackl, LMT. Jamie omitted the milk and just used veggie broth and used just a cup of extra sharp aged cheddar and it turned out well, but you could certainly stick more closely to the recipe. I also subbed out Banza pasta made of garbanzo beans instead of traditional pasta. 1. Cook the macaroni according to package directions. Drain and set aside. 2. Heat the butter in a skillet over medium low heat. 3. Meanwhile, peel the butternut squash and remove the seeds. Cut into large chunks. 4. Boil the squash until completely tender and then drain. Place the squash in the blender with the butter, lots of salt, pepper, broth, paprika, and milk. 6. Pour the sauce over the cooked noodles and add the cheese. Stir until melted. 7. Add more salt and pepper to taste. 8. Serve with parsley if desired. ▪ A category of psychiatric disorders which are characterized by anxious feelings or fear often accompanied by physical symptoms associated with anxiety. ▪ A disorder characterized by apprehension of danger and dread accompanied by restlessness, tension, tachycardia (increased heart rate) , and dyspnea (not breathing regularly) unattached to a clearly identifiable stimulus. ▪ Disorders characterized by anxiety or dread without apparent object or cause. Symptoms include irritability, anxious expectations, pangs of conscience, anxiety attacks, or phobias (Italics mine). Some of us experience an anxious time, an episode or a few days. But, there are many people who suffer from an anxiety disorder. They experience panic attacks that are disabling for a period of time that can last minutes to days. They can be frequent, or intermittent. Our mind is a very powerful part of our existence. It can promote healing, and it can cause disease. Many of my pediatric patients suffer from anxiety disorder. Regular chiropractic care can be very helpful. It is not recommended to only see one healthcare professional when you experience a chronic illness. We certainly recommend that in addition to your medical provider, and counselor you add regular chiropractic care if you are struggling with anxiety. In our Chiropractic education, we are taught to promote healing wholistically. The doctor of Chiropractic is concerned that your body, mind and soul are all on a continuum to optimal health. Many sources tell us that stress, anxiety, and mood will affect our health. Commonly in Chiropractic we see stress manifested in muscle tension, misalignment, nerve interference and sleep disturbance. There are many other symptoms that can be accounted to stress. When the mind and the soul are not addressed in healthcare, 2/3 of healing potential is also not addressed. The chiropractic adjustment itself is an amazing stress reliever. By experiencing the deep pressure of an adjustment, the tendons surrounding the bone, the golgi tendon fibers are activated and reflexively produce an increase of many neurotransmitters in the body that help the body deal with stress. Certain autonomic nerve supply that particularly supply your heart and lungs get stimulated with at thoracic or mid back adjustment. Even the neurochemical regulation of adrenaline from the glands above your kidneys are stimulated with an adjustment to your back. Craniosacral adjustments can be very helpful with cerebral spinal fluidity. This is extremely important for your brain to be able to communicate within each lobe to help regulate mood, behavior and connect your thoughts. Getting regular chiropractic care is an excellent investment in your health. Keep in mind that insurance reimbursement is not available for “maintenance” care in Chiropractic. Many insurance companies underestimate how getting regular Chiropractic care can prevent physical injury. However, we think it is well worth it. Nutrition also plays an enormous part of our whole health. If the diet is void of essential fatty acids, the brain chemistry can be altered. There are certain foods that promote mental clarity. Understanding how nutrition can affect the hormones and neurotransmitters that regulate our mental health is very important. Your chiropractor is one of the few licensed health care providers that have nutritional education in this arena. Because our education is focused on physiology and not pharmacology, chiropractors can sometimes be the compliment you may be needing for your mental health. We also place equal importance on your mental, physical and spiritual health. Do not neglect seeking spiritual guidance when you are declining on your health continuum. Prayer, meditation and spiritual counsel are extremely important to your health. Be sure you address all three when you are investing into your health care. 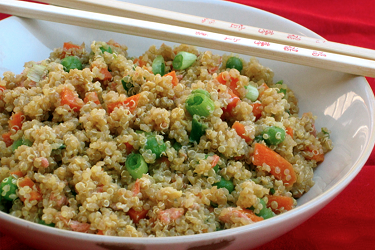 Quinoa Vegetable Stir Fry is a delicious and flavorful dish with an Asian flair. Overall, the anti-inflammatory diet consists of eating more fruits and vegetables, and avoiding processed or refined foods. Limit pro-inflammatory foods, such as refined carbohydrates (think baked goods, breads, cereals, and pasta), dairy products, and red meats. Instead, reach for whole grains, such as brown rice and quinoa; lean protein sources, such as free-range chicken, wild-caught fish, nuts, and lentils; and spices with anti-inflammatory effects, such as cinnamon, turmeric, and ginger. Limit sugar, and avoid artificial sweeteners entirely. Instead, reach for water, herbal teas, or green tea. Black tea and coffee may be consumed in moderation (about 1-2 servings daily), but it is important to remember that too much caffeine can be detrimental to your health. While these rules may seem overwhelming at first, try to pick out just one at a time to start making changes. Each week find one nutritional modification that seems attainable, and try to implement it. Little by little, you will find that you have made over your entire diet! After a period of rest after an injury, it may be surprising how much you might feel capable of doing. Because your body is well-rested, it can be easy to overdo it without realizing it. Whether you are doing more housework or returning to the gym, it is important to remember that your old routine should not be your current routine. Roughly speaking, the amount of time lost due to injury should be about the time needed to return to an old routine. However, the longer you are sidelined may increase the amount of fitness gains, otherwise known as deconditioning. According to the American College of Sports Medicine, cardiovascular deconditioning can occur as quickly as two weeks after ceasing physical activity, and most previous fitness gains may be lost as soon as two to eight months after activity cessation. This, too, depends on previous fitness levels. For example, if you began a new fitness routine for a New Years’ resolution and got injured by March, it is possible that most of your fitness gains will be lost with two months of sedentary activity. However, if you have regularly exercised for two years prior to getting injured in March, the deconditioning process will be much more gradual. It is important to keep all of this in mind when beginning to exercise after an injury in order to prevent exacerbating the condition. A good rule of thumb is to increase exercise by ten percent per week. For example, if your chiropractor has cleared you to return to walking 20 minutes and lifting 10 pounds for 10 repetitions, it likely would be safe to walk for 22 minutes and lift 11 pounds for 10 repetitions per workout the following week. Although these gains may not seem like much at first, they will exponentially increase as the weeks go on, and you should be back to your pre-injury exercise routine in no time! Remaining hydrated is very important on a daily basis, but potentially even more during a period of rehabilitation after an injury. A good rule of thumb is to drink half of your body weight, in ounces, per day. If you drink any “anti-waters” such as caffeinated beverages, it is a good idea to drink and additional eight ounces of water per serving. If you exercise, make sure you drink water before, during, and after your work out in order to replenish the amount of fluid lost in sweat. Your body is mostly made up of water, so drinking water helps support circulation of blood and lymph, which, in turn, helps to flush out any inflammatory chemical out of your body. Drinking water also helps your cells function more optimally by maintaining the important balance of fluid and electrolytes. Muscle, ligament, nerve, and brain tissue, among others, can begin to heal better with proper hydration. Once you begin to focus on the active care of your healing process, you may notice that you heal more quickly. You may even notice that you avoid future injury because you have made lifestyle modifications to support improved overall wellness. Be sure to consult your chiropractor with any questions or concerns you may have regarding your own active care!